Born in Tibet, loses parents, aunt ships him off to a monastery, China exiles him to India where he decides to sing, rap, act, and write in the hills of Dharamsala. 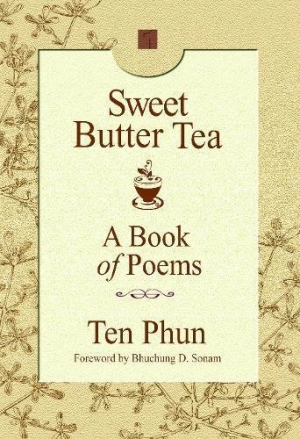 Ho hum, Ten Phun, get back to us when you have something to write about. Ah, but the huge monastery was lonely until a small library of Snow White, The Adventures of Pinocchio, The Frog Prince, Beauty and the Beast, and other fairy tales—all translated into Tibetan—appeared in the abbot’s storeroom and suddenly the world grew warmer and ever so much larger. Now I just want to feel the emptiness. This is not a sign of weakness. My fears grow faint and my love grows steadily. Now I just need a nap. I feel happy when I feel the ocean’s stillness. I want to take a deep breath. I want to be naked and eat grass.